Rail chain signals are used for automated transportation on a railway network. With rail chain signals, it is possible to use multiple trains on a single track, or multiple rails that intertwine. The best prerequisite to understand chain signals is to understand signal blocks. Rail chain signals are placed like block signals at the right side of a segment. They work similar to pre-signals in OpenTTD. While normal signal prevents train from entering the occupied block, chain signal prevents train from entering the block also when the exit isn't free. When more exits exist, the one relevant to the train path is taken into account. With a regular signal, the block it guards is empty, so the train can go there. 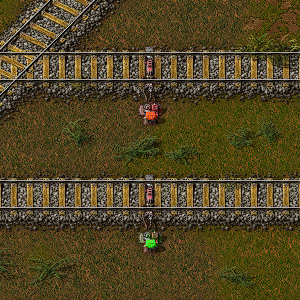 Chain signal with one exit doesn't allow the train to enter the block, as the exit is occupied. The chain signal prevents the train from blocking the other route while waiting. Double crossings are the cause of train jams often, as trains tend to get blocked in the middle of the crossing. It can even cause total deadlock, which require manual intervention to fix the problem. With chain signals, the non-blocking rails are still separated, but trains won't stay in the middle of the crossing. One of the typical situation with train deadlock problem is the usage of single train line for both direction with occasional bypasses. The example of the blocked situation with regular signals. With chain signals, this problem can be totally avoided by preventing the train from going to the shared section unless it can exit it. Some good pictures are at the Friday Facts #81 page. If the chain signal has only one exit, it doesn't allow the train to enter its block, if the exit block (which has a rail signal) is occupied. If in the block of the chain signal is a crossing, trains that cross the block can pass it, because a train waits before the chain signal, if the exit block isn't free. If there are more than one chain signal blocks before a regular block, a train waits before the first chain signal if the regular block isn't free. If a chain signal switches to green, all exits are free. If it switches to yellow, the block is reserved for a train and the signals of intersection blocks switch to red (like regular signal). If it switches to red, no exit is free. If it switches to blue, at least one exit is free.